Alexandrine Parakeet Personality, Food & Care – Pet Birds by Lafeber Co. Loyal, playful and talkative are words used to describe the Alexandrine parakeet, which can also learn tricks and is inclined to show off its acrobat skills. The Alexandrine parakeet, also called the Alexandrine parrot, is a bright, gentle, independent, medium-sized bird known to be hardy and relatively quiet compared to their Indian ring-neck cousins. This bird is a favorite among fanciers and is becoming more popular in the pet trade than in past years due to its growing popularity with bird breeders. The Alexandrine parakeet is named after emperor Alexander The Great (born 356 B.C. ), who is said to have had numerous Alexandrine parrots exported to Europe and the Mediterranean, where it was popular with nobility and the upper class. The Alexandrine parakeet is native to East India to Hyderabad, Andhra Pradesh in the South, Sri Lanka. Alexandrine parakeets need a cage tall enough to accommodate their long tail feathers, which can be up to 14 inches in length. Alexandrines, like most parrots, are chewing machines and need lots of softwood toys to keep them happy. Add on a few rope toys and a couple of indestructible acrylic toys, and the Alexandrine is ready to play. Puzzle toys that hide nuts or dried fruit can be especially entertaining for an Alexandrine parakeet, which is always ready for a challenge. Alexandrine parakeets will generally live peacefully with others of its kind but might be aggressive toward other birds. The Alexandrine parakeet’s beak is powerful and large, so keep smaller birds out of your pet’s reach. If you have a “cousin” bird, like an Indian ring-necked parakeet, you can let the birds play, but you should not let the two species breed. All in all, the Alexandrine is a lovable, intelligent parrot that can live more than 30 years if cared for properly. Alexandrine parakeets’ diet should consist of a pelleted base diet, as well as fruits and vegetables. 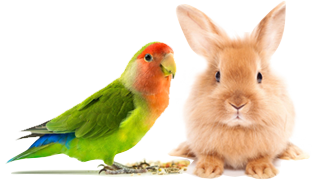 Check out Lafeber’s Premium Daily Diet pellets, Nutri-Berries, and Avi-Cakes. The shape, textures, and ingredients encourage increased food interaction, which results in nutritious foraging that’s healthy for birds. The Alexandrine parakeet is playful and can be quite talkative, able to amass an impressive vocabulary. This bird can be a wonderful family pet. Alexandrines are loyal birds, and often bond with multiple family members, unlike a few other species. They are quick to learn tricks and are capable acrobats. The novice and the experienced bird keeper will enjoy the Alexandrine, but this bird may not be for the very beginner, though someone who has kept a parakeet or other small bird healthy and happy may be ready for the easy-going Alexandrine parakeet. Alexandrine parakeets are not known to be nippy, in spite of their huge beak, and are extremely affectionate when given consistent attention. Because Alexandrines are highly affectionate and love their human “flock,” they need a person who is able to give them a great deal of time out of the cage. The Alexandrine parakeet can emit a powerful screech that is said to be deeper than that of its close cousin, the Indian ring-necked parakeet. Alexandrine parakeets have excellent mimicking abilities and can copy just about any sound. Alexandrine parakeets are relatively healthy birds; however they are susceptible to Polyomavirus, pssitacosis, apergillosis and bacterial infections. Alexandrine parakeets are typically available from avian-specialty stores and bird breeders. The nominate Alexandrine parakeet has all-green plumage and an immense beak. As with many birds in the ringneck family, color mutations are becoming more widely available to consumers, including the lutino (yellow) and the blue mutations. The Alexandrine comes in five distinct subspecies, some slightly larger or smaller.